With spring in Colorado comes powerful thunderstorms. These storms are often severe and damaging. High winds paired with large hail makes spring storm season across the Front Range a catastrophic season for any items standing in the way. This is particularly true for vehicles, which are often severely affected by hail storms. 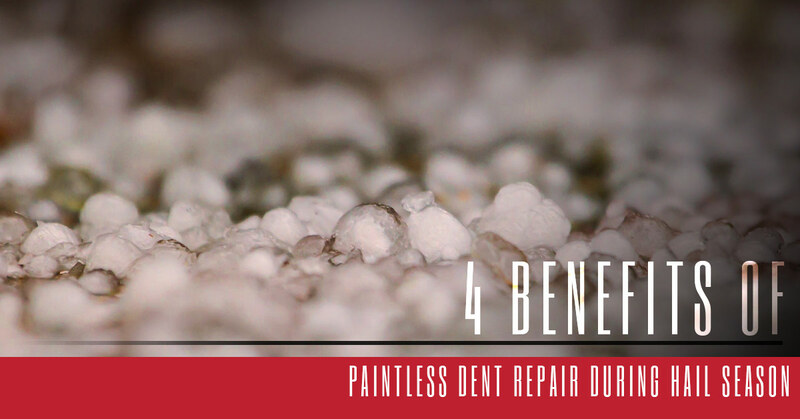 If you were recently in a hail storm or you are worried about the hail season ahead, check out the five benefits of choosing paintless dent repair during the storm season. Feel free to also reach out at any time to learn more about paintless dent repair in Denver or across the Front Range by AJ’s Dent. We will be happy to assist you in repairing your vehicle post-storm. One of the top reasons to choose paintless dent repair when your car has been damaged by hail is due to the speed of service. In many cases, after a major storm passes through the area, auto body repair shops are backed up. Traditional repair methods involve a long process of sanding down the area, applying paint to fill in the dent, and ensuring that the paint is level and matches the area. For this reason, only so many cars can be serviced in any given day. Conversely, paintless dent repair is an extremely efficient method for repairing hail damage. The dent is actually removed from your car utilizing special tools. All that is required is access to the backside of the dent. The process is quick, efficient, and allows technicians to service multiple cars in a shorter period of time. This means that you can schedule repairs much sooner with a paintless dent removal shop even when most places are backed up due to a major hail storm. Another benefit of paintless dent repair versus traditional repair methods is that the process is extremely eco-friendly. Because the dent is actually removed from your car, rather than filled in, no harsh chemicals or paints are needed. A reusable tool is utilized to remove dents, which means no waste between cars. If you are looking for an environmentally friendly way to handle auto body repair, paintless dent removal is the best choice. When you fill in a dent with after-market paint, there is an inherent risk that the job will only last so long. Over time, the filled in area can wear down and look mismatched. Conversely, paintless dent removal simply restores your car’s body back to its original state. For this reason, it provides long-term results that you can trust to last year after year. In fact, at AJ’s Dent, we provide a lifetime warranty on our paintless dent removal. We are that confident in our methodology. As you shop around for dent removal services, you might notice extremely high prices. This is particularly true right after a major storm when auto body repair shops have a lot of work. Paintless dent removal is a much more affordable option. The reason why we can offer our services at a lower cost than most dent repair solutions is because of how quickly the service can be completed. While we always take the time to ensure your vehicle is properly repaired, the method we use is so efficient that we can pass on the time saved as monetary savings to you. Whether a big hail storm just passed through your town or you are hoping to fix a few dings from the parking lot, we are here to help. At AJ’s Dent, we can work with you to ensure that the dent removal process is fast and painless. We even provide pickup and delivery services. This means that we will come to you, take your car for repairs, and return it in no time at all. For repairs that will take longer, we also provide free car rentals. Our goal at AJ’s Dent is to provide you with convenient and affordable paintless dent repair in Denver and across the Front Range. You can count on our quality workmanship and fast turnaround time. Contact us today to learn more about scheduling repairs for your vehicle.